TURCK is expanding its line of In-Cabinet, Block I/O stations with the addition of the FEN20 I/O stations for Industrial Ethernet. 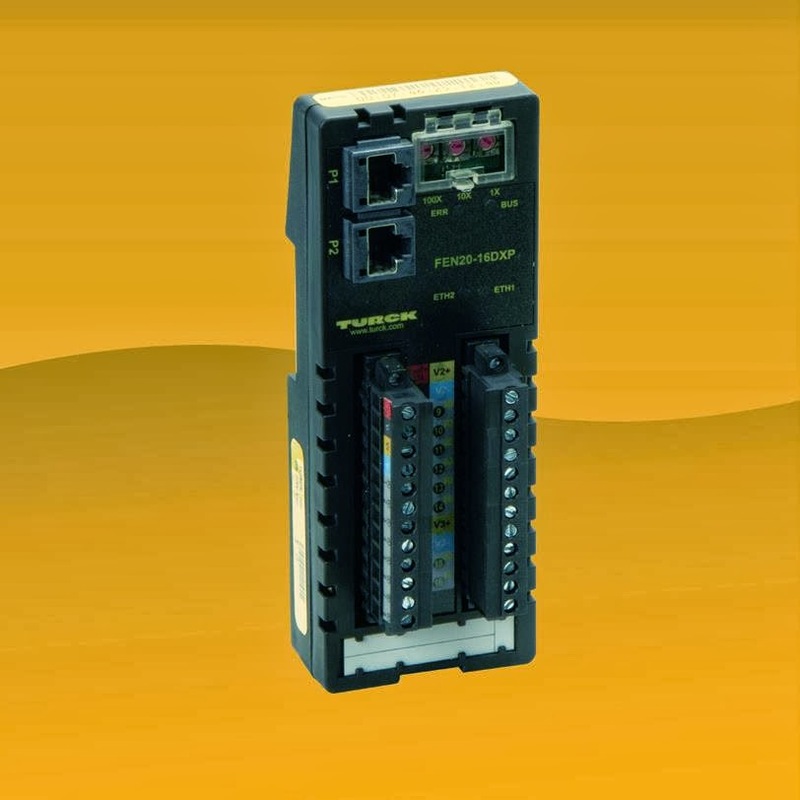 This station incorporates TURCK's Industrial Ethernet multiprotocol technology into a fixed, economical, in-cabinet I/O product ideal for applications where digital I/O needs to be elevated to an Industrial Ethernet layer such as EtherNet/IP, PROFINET, or Modbus TCP. The FEN20 I/O stations are available with 16 configurable I/O, with power isolation between I/O zones, and an embedded Ethernet switch to support a variety of application topologies. The station can be addressed via an external rotary switch or via a webserver which makes troubleshooting easier, quicker, and more cost-effective. The FEN20 supports DHCP, LLDP, and includes LEDs for status and basic troubleshooting. TURCK's Industrial Ethernet multiprotocol technology is an innovative approach to Ethernet applications. A single station can operate on a Modbus TCP, EtherNet/IP or PROFINET network. Upon power-up, the station automatically recognizes the protocol of the master that tries to connect to it, and dedicates the outputs to that master while still allowing other protocols to access the input data and diagnostic information. "The FEN20 in-cabinet I/O modules employs a unique housing that makes it perfect for uses in light towers, push button, or operator panels" said Christian Vitale, Sr. Product Manager at TURCK. "The FEN20 I/O station completes our family of in-cabinet, block I/O stations that can also be used in PROFIBUS-DP, DeviceNet, AS-interface and now multiprotocol Ethernet fieldbus applications."